The last thing I am is the man who starred in CHiPs. Who am I? 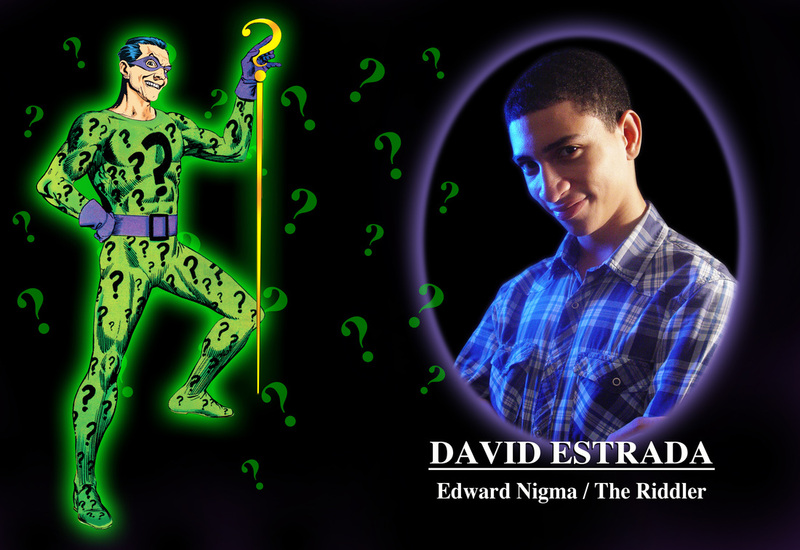 David Estrada, 17, is a native of Manhattan and senior at Léman Manhattan Preparatory School. David is an accomplished young actor of several impressive stage productions at the Theater West program in New York’s Franciscan Community Center where he started acting at the age of 7. He has performed in virtually every stage genre from comedy to drama, to musical theater, appearing in such plays as “Once On This Island”, “Bye Bye Birdie”, “Elephant’s Graveyard”, “Short & Sweet: A Ten Minute Play Fest”, “Rehearsal for Murder”, and “Godspell”. At Leman Manhattan, David also acted in “Barnum” and also played Seymour in “Little Shop of Horrors"
He now employs those considerable acting talents in his villainous portrayal of THE RIDDLER in "FATHERS OF THE DARK KNIGHT".